Our Valet Key Chain makes it easy to take the keys you need with you and only leave what you have to, giving you extra piece of mind when having your vehicle valeted. And we could all use a little more piece of mind these days! 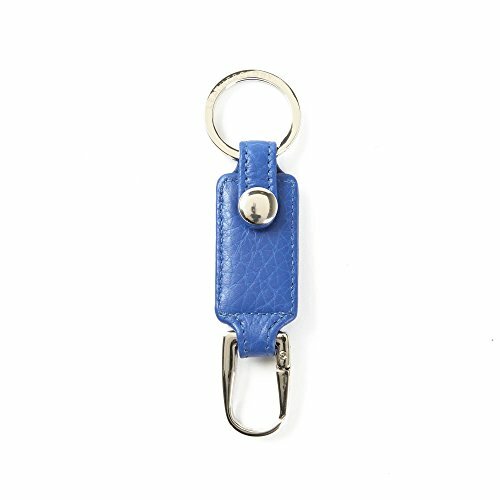 Simple in design, this Valet Key Chain is made from top quality leather with nickel hardware and a Leatherology logo imprint. The clip key hook and snap button make it quick and easy to remove or add keys, letting you keep your home, business, and other important keys with you when the valet leaves with your car. Don't risk the valet losing any of your important keys ever again - let our Valet Key Chain do the job and they'll be safe with you all night! Our Classico leather collection is a semi-aniline, drum dyed pebbled leather. It offers a little extra color and character, making it a good choice when you want your accessories to stand out. This full grain leather has a soft hand feel with intricate lines, giving it a distinct look from our smoother leathers like Vero and Zita. It comes in a wide variety of colors that you won't find in our other collections and has a polished finish to make them really shine. Its unique appearance and range of colors make it ideal for matching with purses, belts, or other leather items you own.